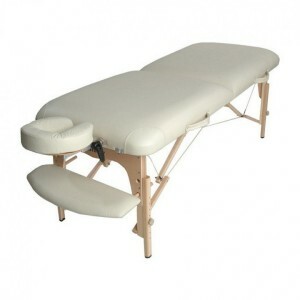 Affinity Massage Tables are very high quality. They don’t compromise on any feature and create beautiful high-end professional massage tables. The Affinity Deluxe in my opinion is the best of their range. It has stylish looks and would look great in any spa setting. As with all professional grade massage tables the leather and foam is the highest quality available and far superior to lower priced tables on the market. The arm shelf is different to most other massage tables in that it slots into the legs of the table and doesn’t hang down from the headrest. It is large and secure and offers more comfort. It comes with a wheeled carry case for easier transportation if you need to bring it about with you. The foam is very comfortable and supportive and the face cushions is thick and luxurious and cut ergonomically to the shape of the face. Round corners with reinforced stitching make the upholstery stronger and more reliable over the longer term. PU leather makes it a very soft surface to lie on bare if you so desire and it is more durable than PVC. It wipes clean easily but IMO you should be using couch covers so you shouldn’t need to clean your table too often. I don’t own this particular massage table but have 3 therapist friends who do. I have borrowed it from one of them to try out and asked all 3 for feedback in order to review it carefully. Do you own this massage table? Leave us your feedback below in the comments!